The great thing about the underground is the grapevine, and social media is the new word of mouth. The Write Reviews has connected with C.E.O.’s, executive producers, managers, relatives, influencers, significant others… the list goes on. Somehow, we have the extremely good fortune of crossing paths with some exceptionally talented and skilled artists who give fans an experience. Furthermore, there are times when an artist is magically put in front of us without even knowing they are there. I’m not sure this is the situation with B.Good but I do know he was not the one that reached out to me for this review. Regardless, I know there’s one thing B.Good couldn’t have known, and that’s who would be reviewing <em>Emotional Torment</em>- none other than the Expert Examiner, Issac Sandoval. Many have said Issac is the hardest to please on our staff; I think Issac simply has the desire to help artists be the best they can be. Anyhow, let’s get to the breakdown of <em>Emotional Torment</em>, shall we? Get your copy of Lucidity EP by Myndframe here. You’ve heard of starting with a bang? Well few albums begin with a bang right at 0:01, but B. Good jolts us to attention in the time it takes the sound waves to reach our ears. The title isn’t misleading either as there is certainly screaming, both at the beginning and at points through the rest of the intro. B. Good’s delivery is excellent as he cycles through patterns and different voices while tackling some high brow subject matter. While I feel I have a competent grasp of it, I certainly am not going to assume that I caught it all. Not only on this record, but throughout the album B. Good is going to be addressing topics that will require repeat listening. That being said, the intro is great, I feel that it sets up the listeners for the experience that is coming. The hook for “Something Wrong” is fairly catchy, but excels at being much deeper than most hooks of similar catchiness. That combined with the instrumental I think would make “Something Wrong” a very suitable lead single for the album. The vocalization in the instrumental is angelic, yet haunting, and I find myself unable to avoid focusing on it. I feel that it takes away from B. Good’s verses, but not necessarily the track as a whole as I still thoroughly enjoyed “Something Wrong”. I’m glad to see the switch up in the instrumental sound here at track 3. One of my major qualms with the underground is that many artists put together albums where too many songs sound the same as the rest of the project and sound the same as other artists’ projects. B. Good still does what B. Good does despite the sound switch, he brings a creative approach to the beat that’s full of personality and charisma. If I have any complaints about this record it’s the line: “cancerous like a divine Newport,” and that is simply because regular Newports are cancerous as well, no? Phew! B. Good can chop with proficiency! Another thing that is rampant in the underground is people who cannot chop well, insisting on chopping on an abundance of records. I’m also somewhat relieved that B. Good doesn’t stay in this pocket for long, but rather switches his patterns numerous times here just as he has on the previous three tracks. B. Good’s attention to detail is showing through these first few songs, with screaming being an integral part of the intro. As well as the constant ticking in the beat for a track titled “Don’t Wait For Too Long”. Whether he is putting the subject matter to the beat, or molding the beat around his concepts and topics matters not. Those of us with the ear for these kinds of things appreciate the thought put in. Overall I like “Parasite” well enough, but one thing I am not a fan of, and many of you may feel the same, is Lil Mocha’s voice. That combined with the hand her engineer played in it just delivers a scratchy and warped sound that is not sonically pleasing to me. Fans of horrorcore may disagree with me, that’s fine, but your traditional Hip-Hop fan will more than likely side with me here. B. Good does enough to save the record, but so far probably my least favorite. Sadly I think “Who Can I Trust” is a record that nearly every one out there can relate to, so I feel this could be a follow up single for the album. It’s a little darker and less catchy than Something wrong, but I think this song could really be enhanced with some visuals. The vivid rhymes already have me envisioning the song in my mind, and a solid video I think could really allow B. Good to steer us exactly in the direction that he wants us to go. The beat would be your typical underground type if not for a few unorthodox noises that I can pick out buried in the mix, great song. I’m torn when it comes to “Smoke N Fiya”, I love the direction that B. Good is headed. I love the sampled interludes in between the verses. Where I struggle with this record is that I really think that there’s a lot that I’m missing here. I put some of that on me, but I still feel that it is the artist’s responsibility to convey the message to the audience in a manner that is understandable. I also wish that I could clearly hear the outro sample through the song, I’m very interested in what this unidentified voice is saying. On the positive note though, B. Good delivers a sonically well rounded track, solid production, great concept, and his delivery is on point as always. After switching up the sound again, B. Good has found himself a sound that he wants to roll with. The songs still have an individual sound to them, which is key. The hook to “Caution” is haunting and addicting, the delivery has the aggression dialed back for the most part. One of the things B. 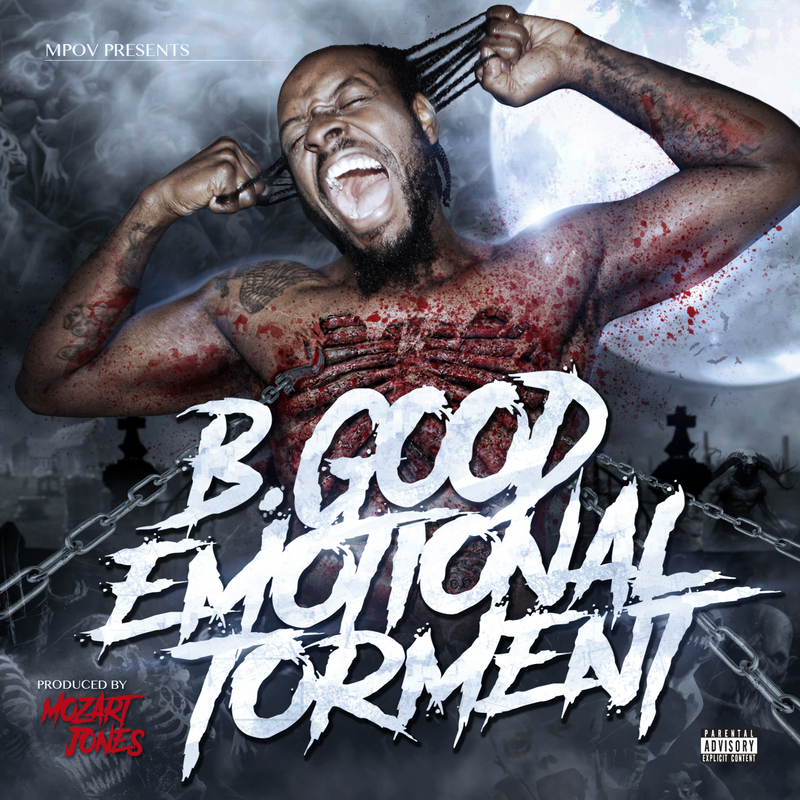 Good does best is finding the appropriate tone for each portion of each track, clearly a seasoned artist. The sirens and police scanner intro are not the most original of sound bites, but I’ll let it slide on a dope record. The hook is simplistic, but on a joint that’s all about showcasing the emcees, I’ll never be mad at that. This time B. Good is chopping for his entire verse and he can hang with the best of them, Shevy Chase has a voice that grabs your ear and holds on for the duration of his verse, and Hybrid wraps up the record bringing a style all his own. The three emcees hold their own, and bring their own sound individually, but blend together well giving us a very good collaboration. The ominous instrumental and the circus commencement does a great job of creating a setting for track ten. B. Good displays his ability as an artist on “The Circus” as he discusses entertainers and all that comes with that life. From putting on a face for the public to it’s parallels to slavery. On top of the concept, there’s a bridge unlike anything we’ve heard yet on <em>Emotional Torment</em>, as Smoke E. Digglera pipes a wonderful melody jam-packed with meaning. My new favorite song on the album, I’m a sucker for an emotionally charged bridge. I feel like the spoken intro was unnecessary, but with the heart that’s poured into this record, I won’t fault the artist for it if he felt he needed to say it. As an artist myself this is almost painful to say, but I have to be honest…I feel that B. Good’s verses on “Life Line” are subpar compared to the rest of the project. I can hear the words and I believe them to be true to his emotions, but on this song I don’t FEEL his emotion like I did on other, much less personal tracks from the album. I do briefly feel it in the ad-libs in the hook with Smoke delivering a beautiful hook. Sadly, “Life Line” leaves a little to be desired, however, still far from a bad record. How ironic that to follow the song that I was most critical of, we have a song with B. Good taking aim at a critic. B. Good would make me eat every word I said if I held the same position as the “Hip-Hop Nazi.” And I hope the next time he attacks something as emotional as “Life Line” that I have to eat my words regarding that critique. As a humongous Hip-Hop nerd I absolutely love the ending of the record, “hail Em, hail Nas, hail Q,” and so on. Seeing Smoke’s name again has me excited with good reason as he delivers another excellent hook. B. Good attacks with a ferocity that we haven’t heard since It Is What It Is. On “Serial Killer” our emcee is rapping as though he’s trying to eat the featured emcees, even though there are none. This track is not really anything deeper than its title, but that is all that it needs to be. One of the best joints on the album! At first I thought that it was Smoke who was rapping, B has done something new with his voice, and when you consider the amount of voices he’s used through the first fourteen tracks that is certainly impressive to say the least. Dude should think about doing some voiceover work. B uses “Get Off Me” to continue the rampage that he’s been on since “Life Line”, bringing a barrage of hard hitting lyrics and yet another hook from Smoke, my only fear is that it may get a little redundant. Again it’s mad ironic that the first words of “Get On Up” are “it’s time for a change.” And he not only says it, he executes it, the sound has switched up and the patterning of the verse is something we haven’t heard on this album. This exactly the type of upbeat, positive energy kind of record that you would think would end a project, but he kind of kills that when he begins a “thank you for listening” outro. I’ve never been a fan of these unless they get humorous or creative, and this one was neither, but perhaps the bonus track can bring us back up to where we were before sending us off. I’m typically more lenient regarding bonus tracks because they are not technically part of the artist’s vision of the album. In most cases I feel that this benefits the artist because I have found that more often than not the bonus track isn’t up to the level of the rest of the project and likely should’ve just been left off all together. But “Get On Yo Job” is on par with the rest of the album and I think could’ve been inserted into the track listing and actually helped to tack on maybe another half star. Get your copy of Ohhh! B. by B. (of Dakota South Records) here. <em>Emotional Torment</em> is not what I expected based on the title, but definitely one hundred percent what I expected based on the cover art. B. Good is one of the more polished emcees that I have come across in the year that I’ve spent at The Write Reviews. His artistic vision and vocal execution help to separate him from the very congested underground Hip-Hop scene. He has a delivery so impressive that I would love to see him perform live so that I could see with my own eyes and hear with my own ears if he can flawlessly transition between the many patterns and voices that he employs to truly create a mood and a listening experience that never gets boring. As a whole the album fits together well, both sonically and from a sequencing standpoint, and makes great use of all of its features. If there is room for improvement I would say that overall songwriting would be the area to focus on, this may mean sacrificing a bit in the way of rhyme scheme, at least for a short time. B. Good, I am speaking to you personally right here: if you can improve your songwriting to the point where it is equal with your artistic vision, there’s no telling what you can accomplish. I feel like at this present time your artistry is on a higher plane than your songwriting ability. But if you can get the cohesiveness that you created in this album and put it within each track you will create a classic album, and that is not a word I throw around by any means. B.Good can be found on Facebook! Issac Sandoval would like you to join him on Facebook and Twitter!